Big data, computation and bioinformatics have flooded the research community. At Plant Biology 2017, it flooded the classroom as well. 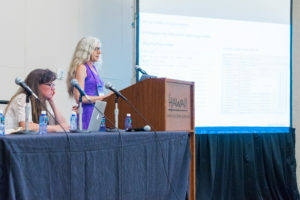 The education workshop, “ABC’s (Analysis, Bioinformatics and Computation) in the Classroom,” featured integration of computation and analysis of biological data into the classroom. Dr. Katerina Thompson, University of Maryland, and Dr. Judy Brusslan, California State University, Long Beach, joined us to share tried and tested techniques and projects they have developed and used successfully in the classroom. Dr. Thompson introduced us to Math Bench, an integrated suite of 40+ interactive, online modules for use in fundamental college-level biology courses. The project, funded in part by NSF and HHMI, introduces and reinforces basic manipulation and graphing of data and understanding of mathematical models and their use in biological systems. Dr. Brusslan shared her strategies for incorporating bioinformatics analysis of RNAseq data in her upper division, undergraduate biology course. Brusslan combines analysis of available RNAseq data using CyVerse pipelines and wet lab confirmation of genes identified to get students excited about big data analysis and give them an introduction to tools that will be needed for a career in biology. She provided workshop attendees with access to data, and everyone got a chance to experience the pipeline from a student’s perspective. 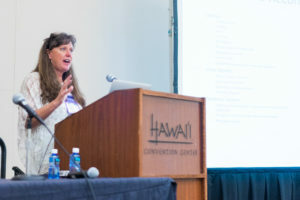 Thompson and Brusslan shared student feedback and assessment, indicating the success of their approaches. Not only is computation becoming the standard for research but also a necessary component of biological education, and these faculty provide excellent resources model for integration of computation into the classroom.